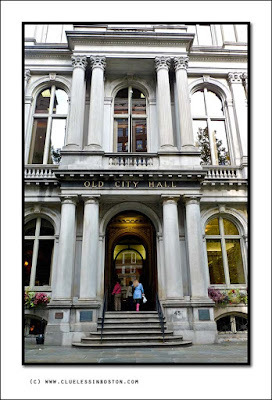 This week's doorway is Old City Hall on School Street. Here are two other views of the buildng. A lot of history has passed thru there. Much better than mine! ;-) Superb. Superb! The light, the colors setting off the grey of the building! It all works perfectly! Would not be the same without the pink boots!! Remember a place called "The Stock Pot" on Newbury Street_?